I am joining Jamie from Tales of a Carolina Girl. She is hosting a blog hop for special ed teachers. She's asking for teachers to give advice. 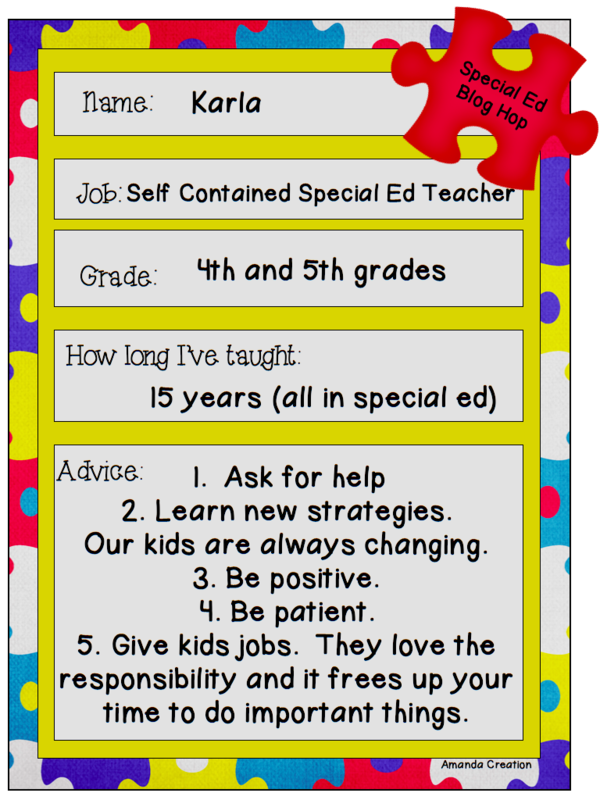 Even if you're not a special ed teacher, hop over and read the advice. You just may find a new strategy for the school year. Head over to read more advice. My district supports full inclusion. I would love to know what your thoughts are concerning self contained vs. inclusion. I think there is no "one size fits all" approach to education. Some students are able to handle inclusion and others need so much more than they are able to get in a general education class. On occasion, some of my students are able to handle inclusion for 1 or 2 subjects. But there are days, they just can't handle the pace/social skills/content and have to skip inclusion and stay with me that day. Hi Karla. Thanks for linking up! I will certainly be asking for lots of help this year. I am hoping not to bug other teachers too much but I know there will be a lot to learn as a new special educator. Even just learning to use the IEP system we have will be a challenge. I'm following you now and look forward to learning more about you! I always enjoy reading your posts. Thanks for the tips. Smiles and stop by anytime! Thanks for the post! I was so happy to see a Special Education blog hop! Yay! I joined up too! Thanks for sharing. Just popping in as I go through the hop. I've been following for a while...Great blog! We have the same first advice! And I promise I didn't cheat and copy you :) It's just a good one. Haha! Great minds think alike! Great advice! 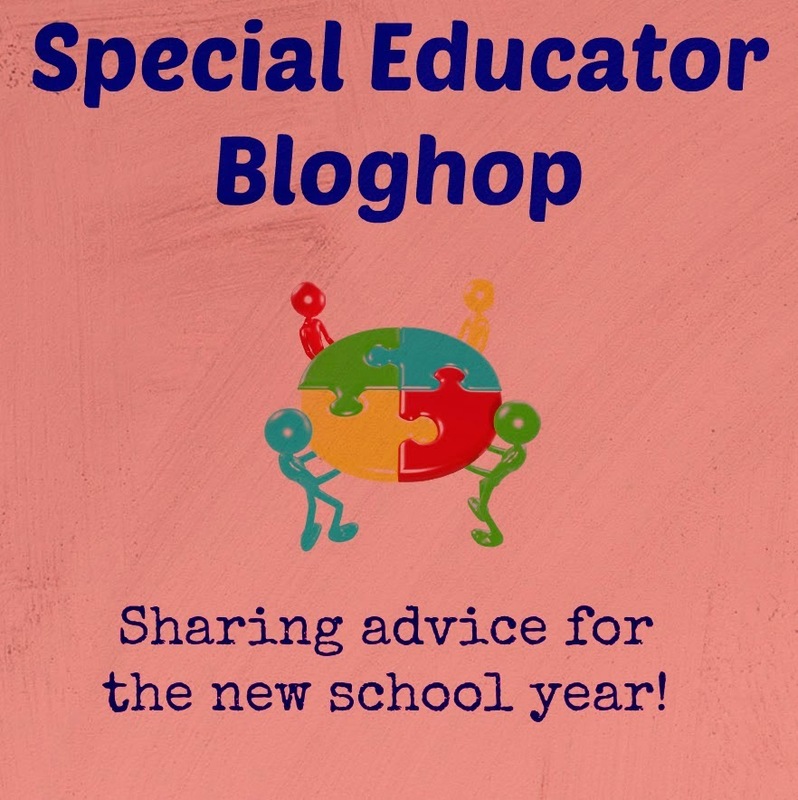 So glad I found another special ed blogger! Thanks! That's great advice. It's hard to stay positive sometimes... but you have to be able to laugh to get through this job sometimes. I've been a long time follower and am glad you posted the bloghop so I could get involved too! It's always nice to meet other special ed teachers! Great advice! It is so important to learn new things. Each student is different every year. Thanks! Great advice! I love that you posted be positive. It's easy to get stressed out sometimes in our position!